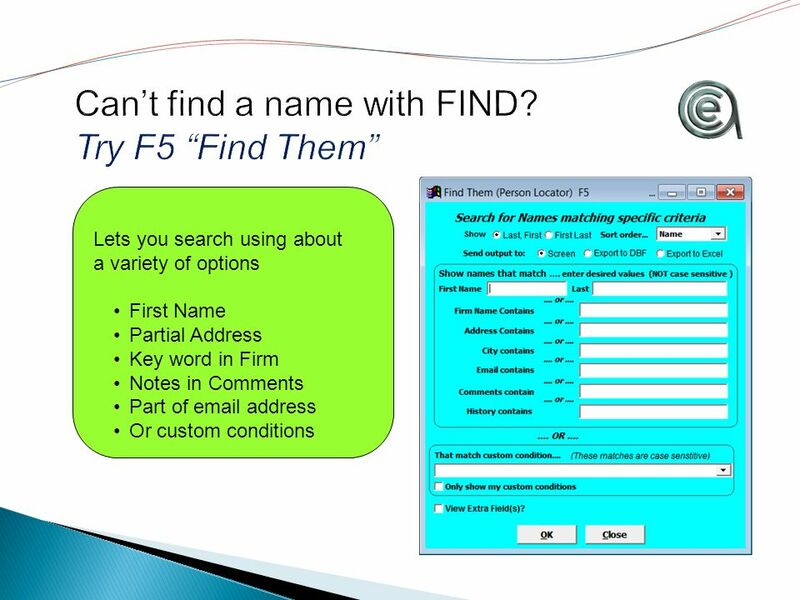 Student Manager 101 Series Part 1/5 Names. 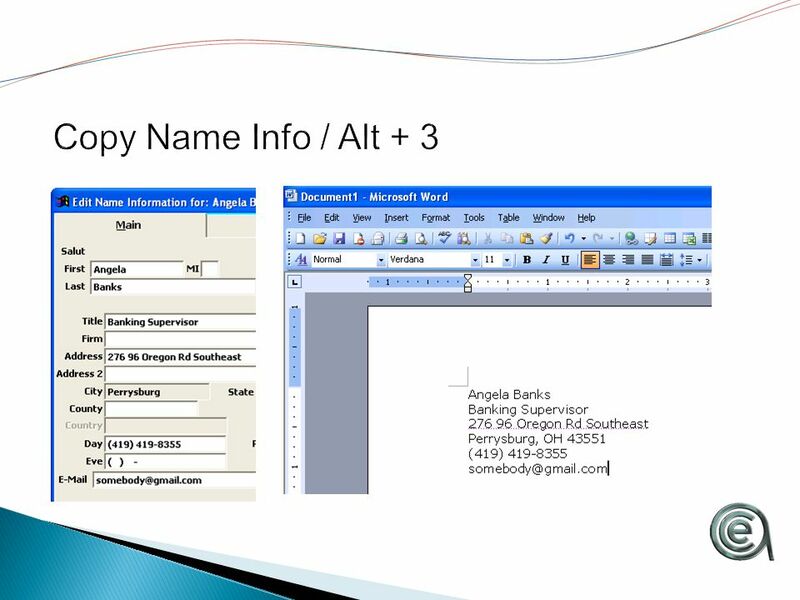 A general intro to Student Manager Inputting a name Editing names A few useful tips. 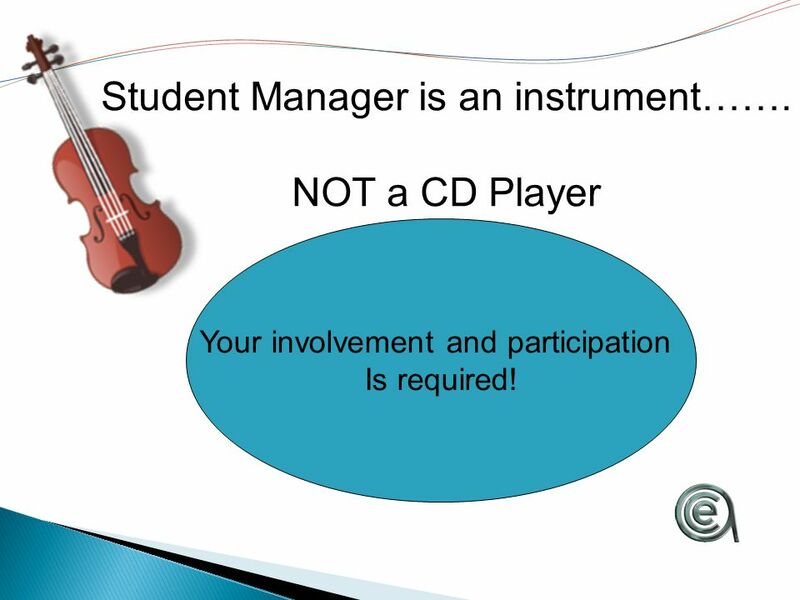 4 Student Manager is an instrument……. 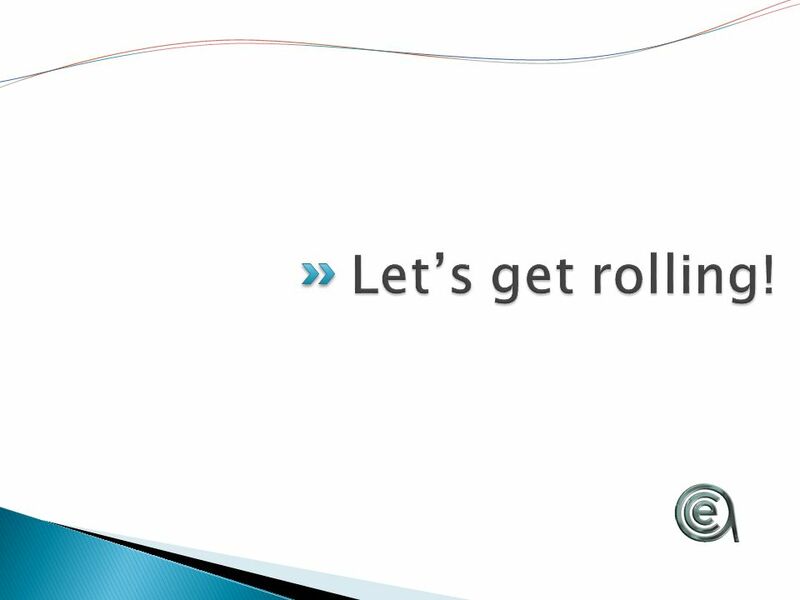 NOT a CD Player (or MP3 Player.. For you “young ‘uns”) Your involvement and participation Is required! 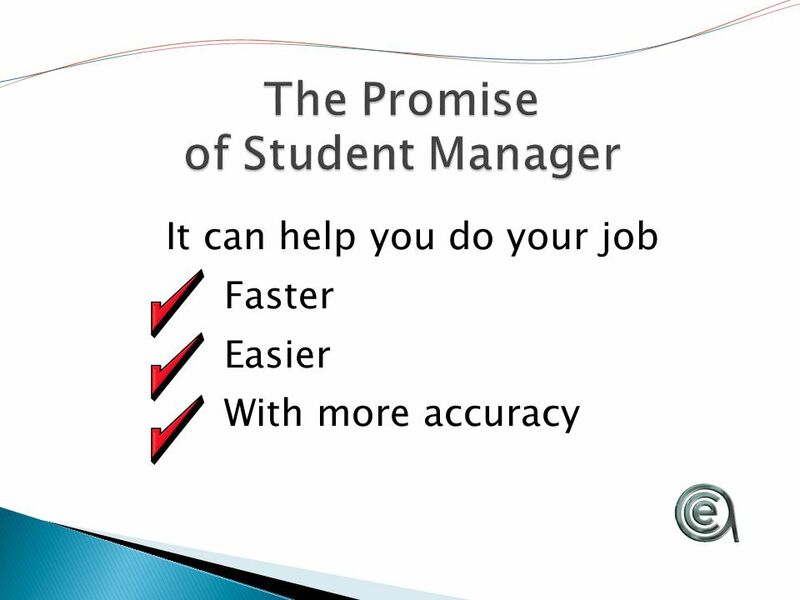 5 So … the amount of benefit you get from Student Manager is directly proportional To the investment you make in learning How to use it… in your environment! 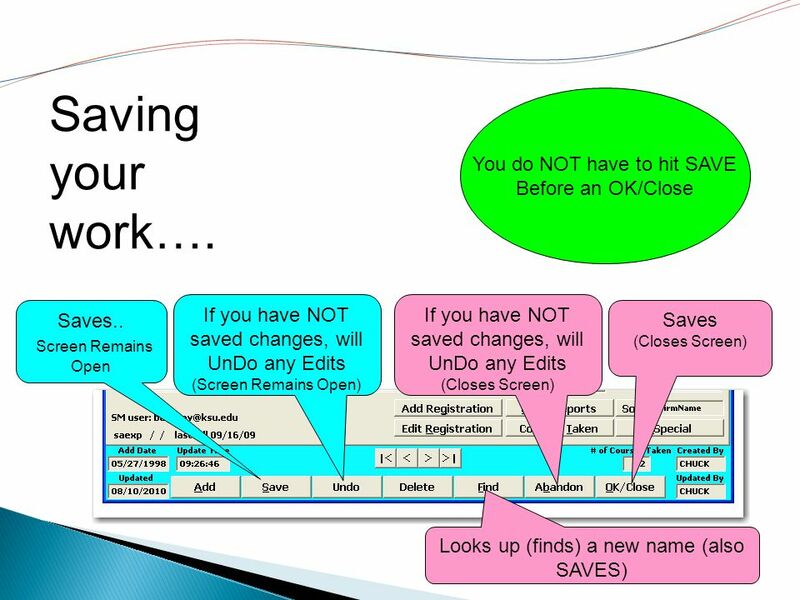 You are NOT alone… You have help…. 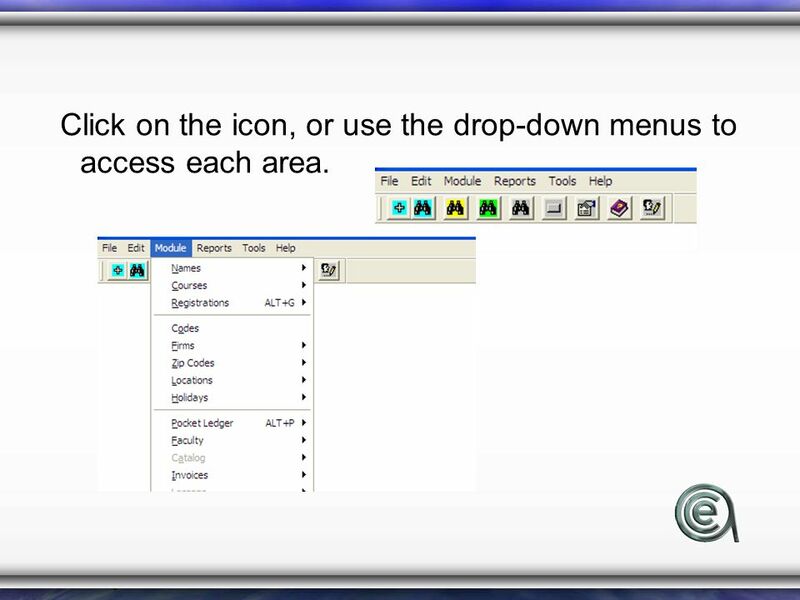 12 Click on the icon, or use the drop-down menus to access each area. 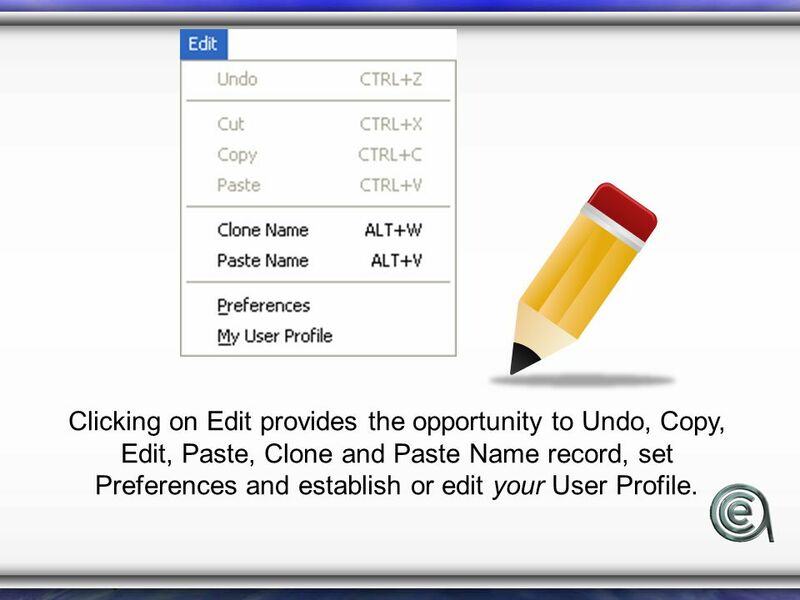 14 Clicking on Edit provides the opportunity to Undo, Copy, Edit, Paste, Clone and Paste Name record, set Preferences and establish or edit your User Profile. 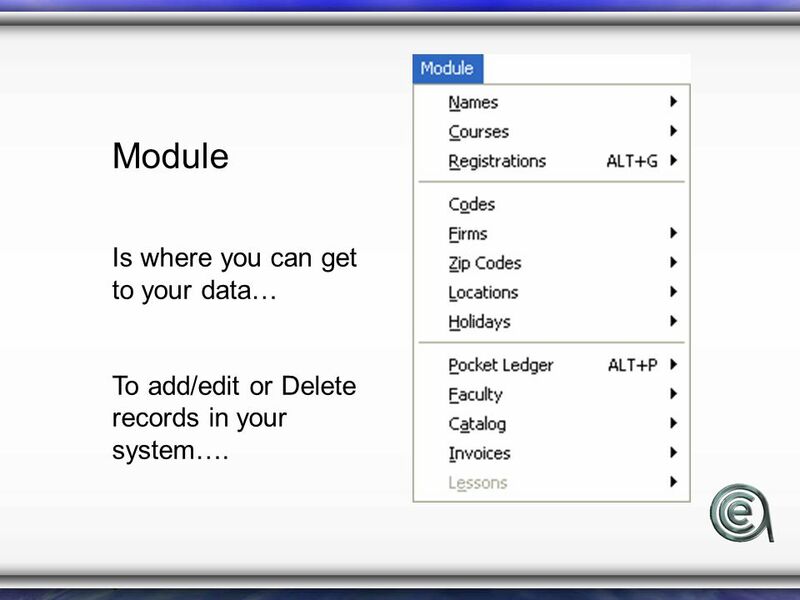 15 Module Is where you can get to your data… To add/edit or Delete records in your system…. 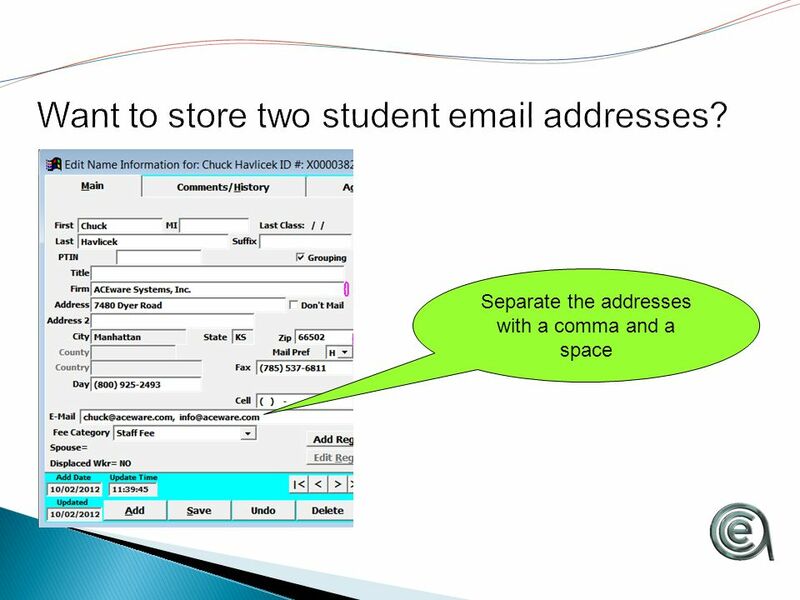 23 Student ID # The ID # is the unique identifier for the Names table. 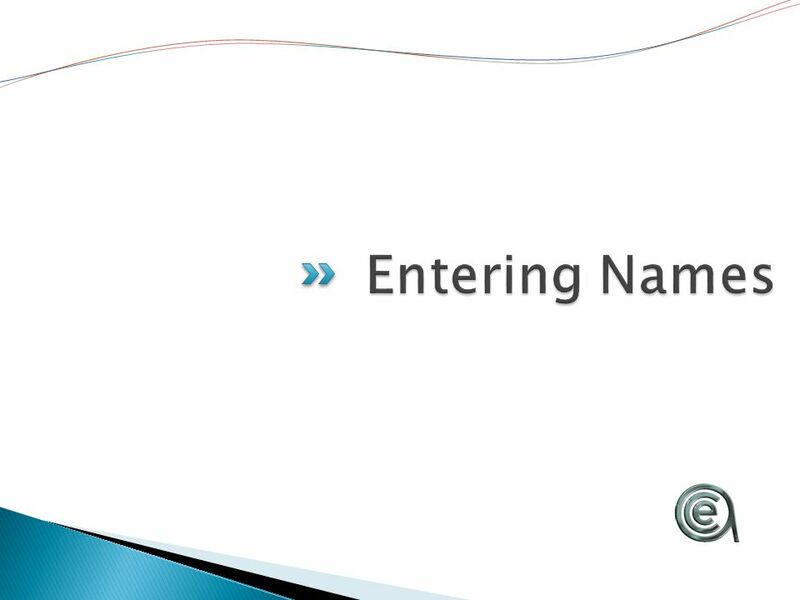 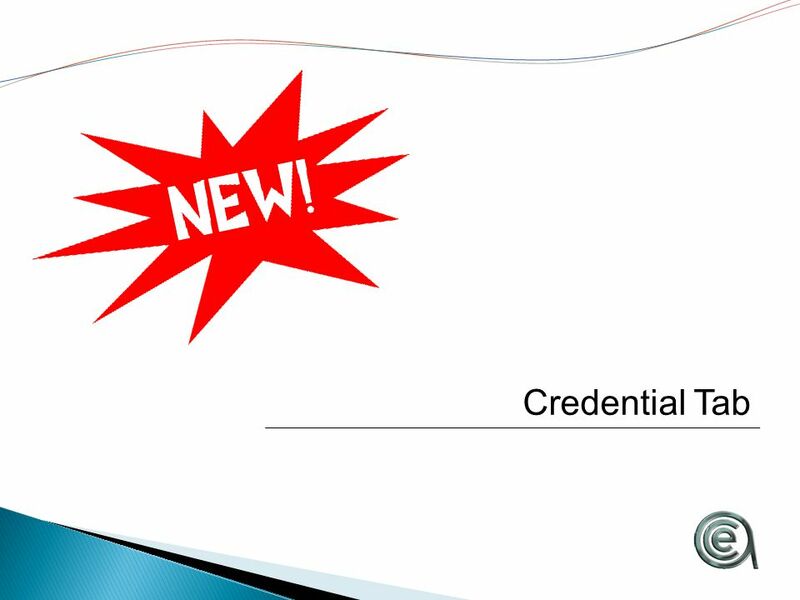 Organizations have the option of entering a unique 9 digit ID, or allowing the system to generate an ID number for the Name record (if you do not enter a #, the system will generate a unique ID number when you save the record). 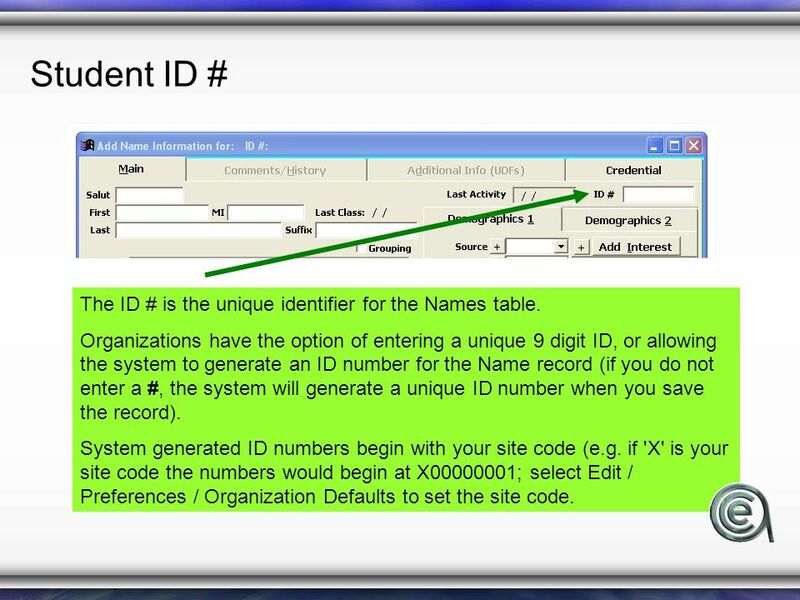 System generated ID numbers begin with your site code (e.g. 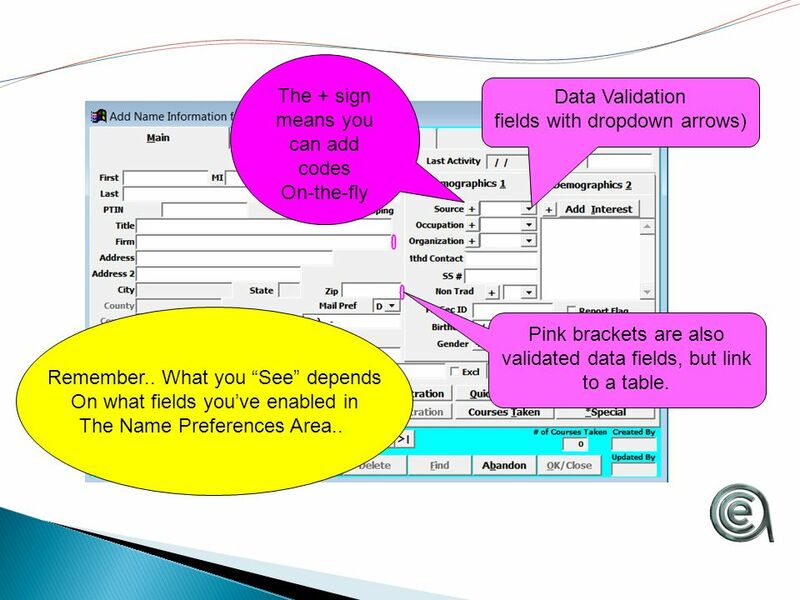 if 'X' is your site code the numbers would begin at X00000001; select Edit / Preferences / Organization Defaults to set the site code. 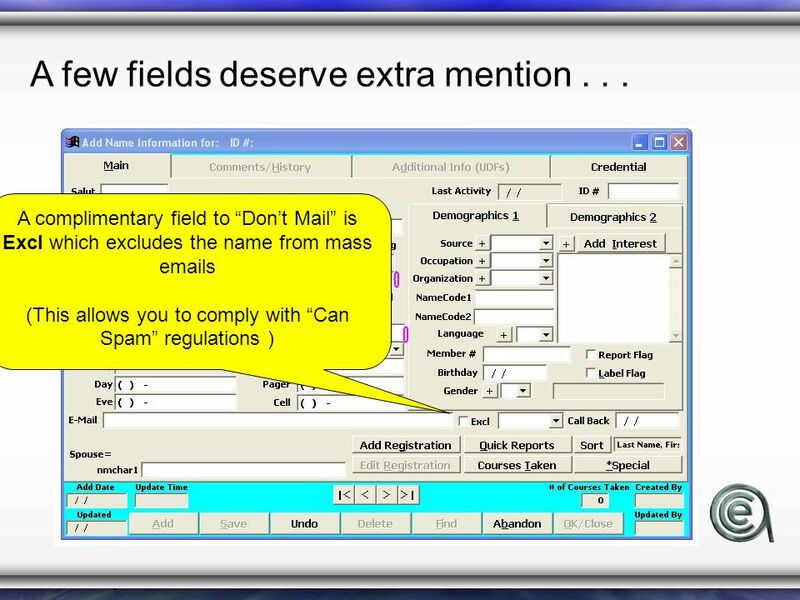 26 A few fields deserve extra mention... 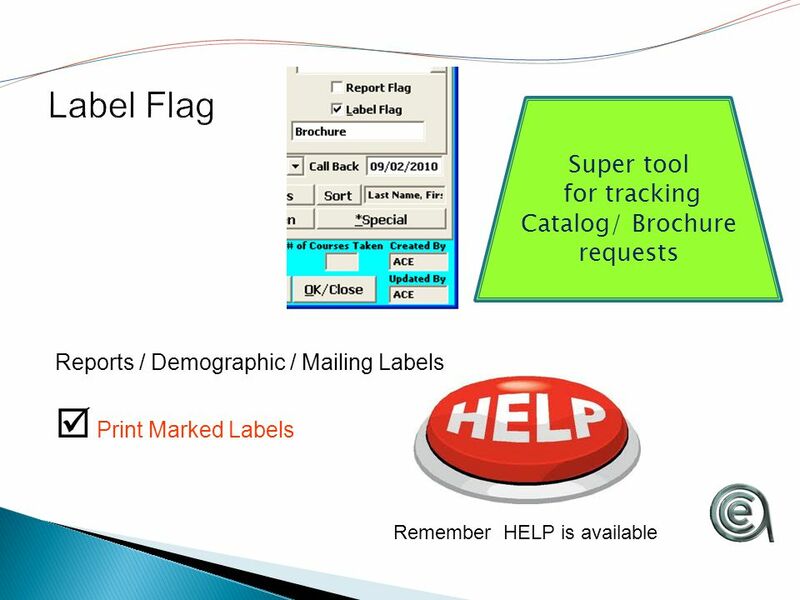 Source identifies how the customer arrived at your doorstep the first time. 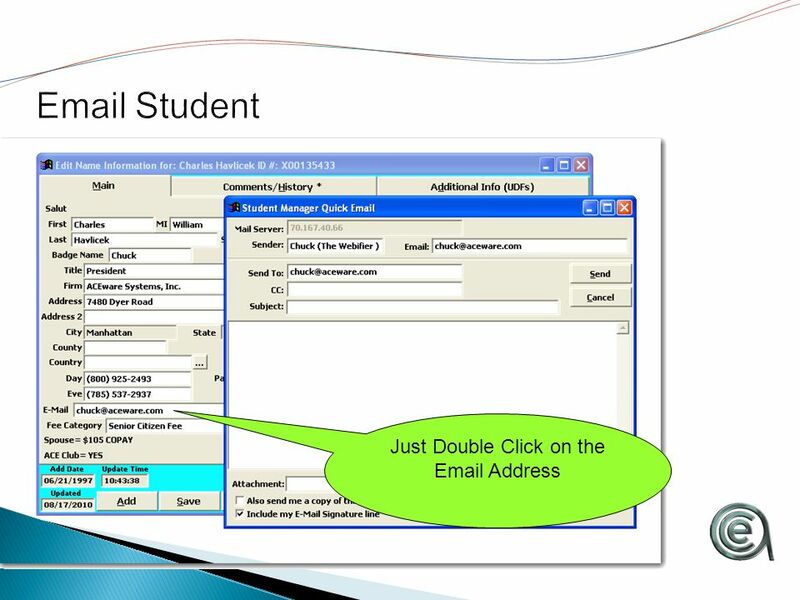 Add Interest identifies those classes in which the customer expressed an interest. 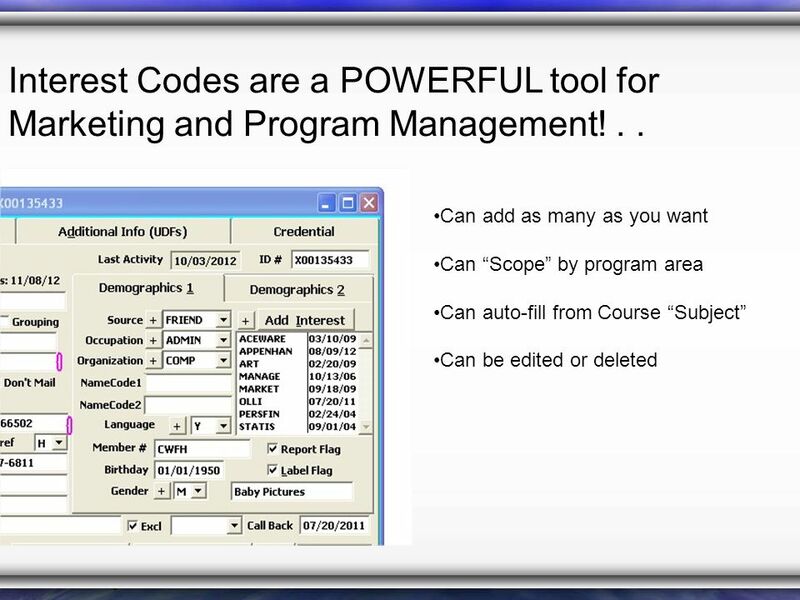 As they register for courses, the subject code from the course is added to this field. 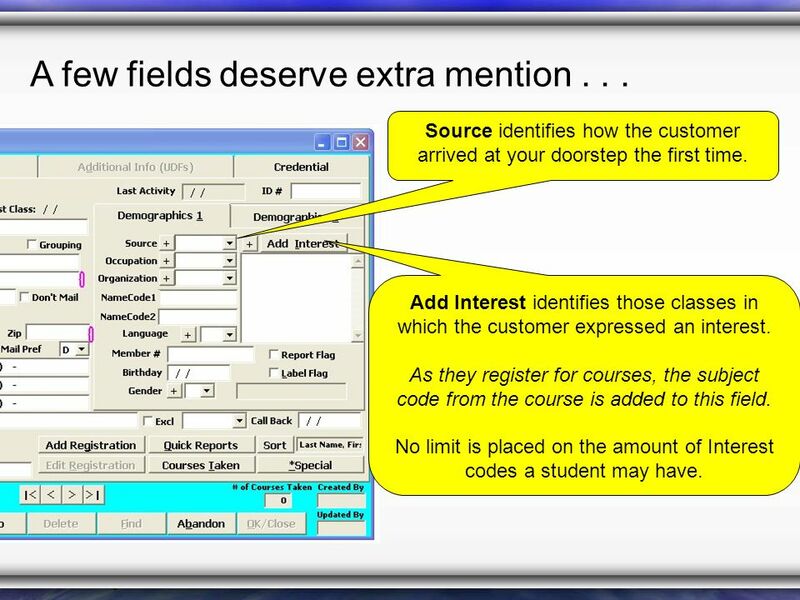 No limit is placed on the amount of Interest codes a student may have. 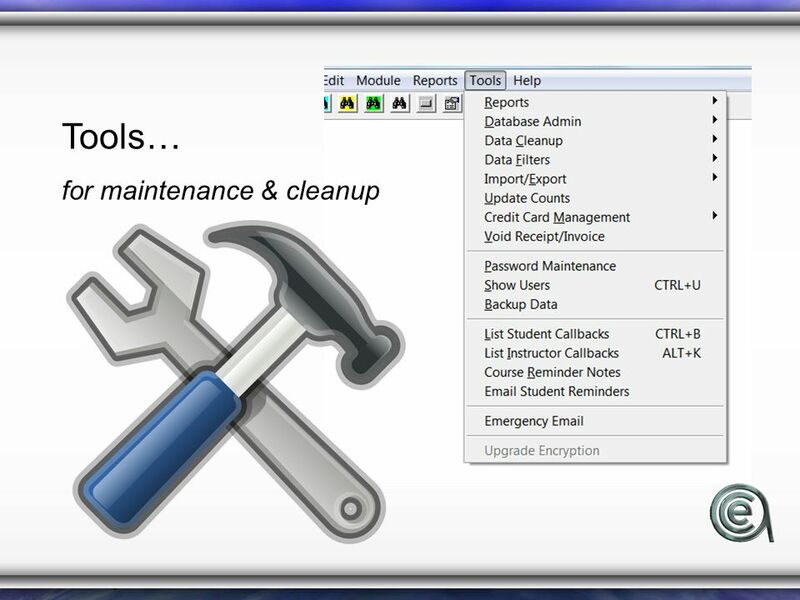 29 Membership(s) A powerful tool to manage, track, and control access to classes. 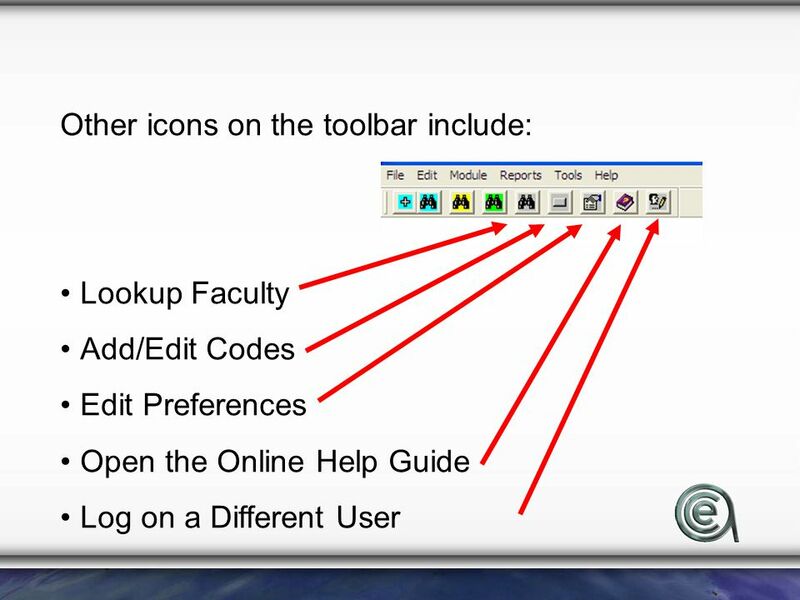 There is a special webinar devoted to handling memberships in the webinar archive. 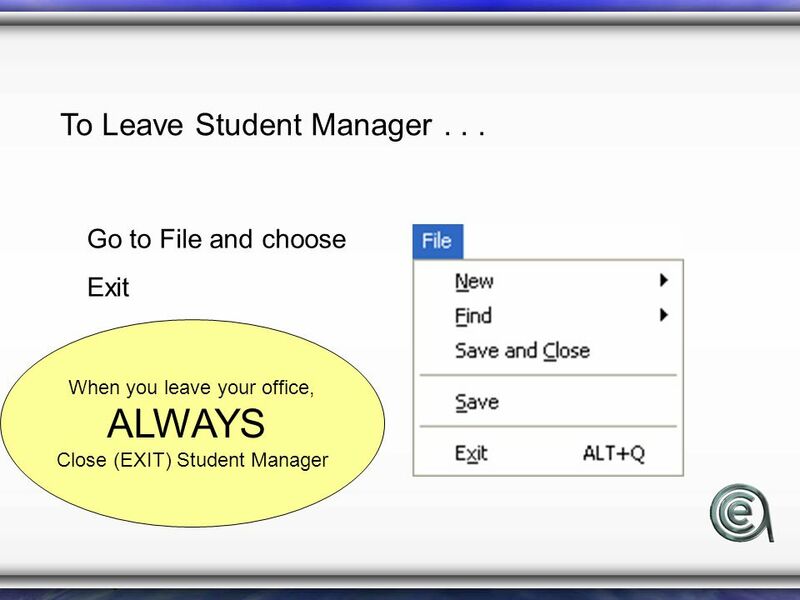 30 Student Manager Automatically adds…. 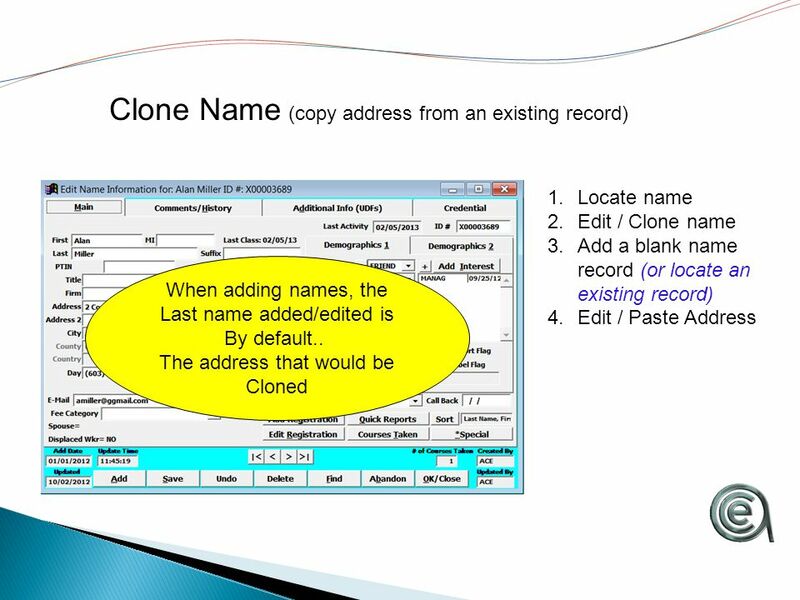 Add Date, Updated Time, Updated, Created by, and Updated by. 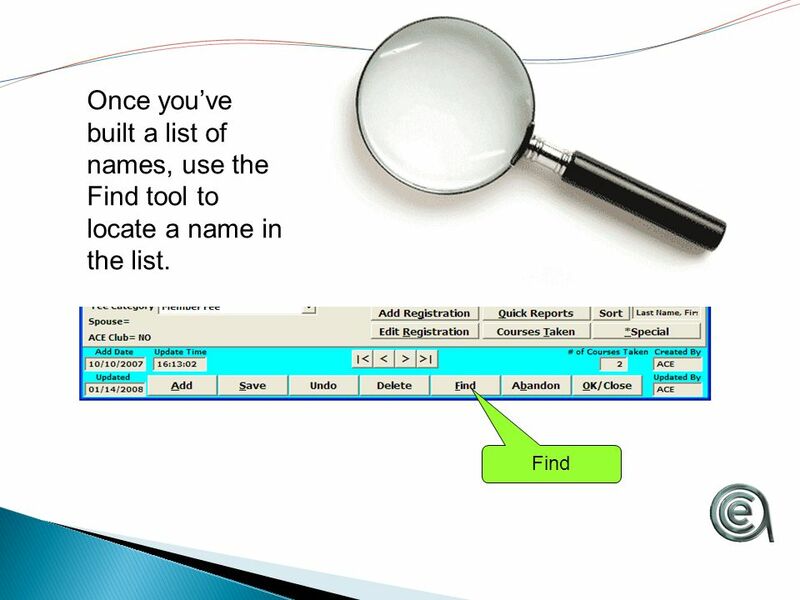 This creates a historical record of activity on the record. 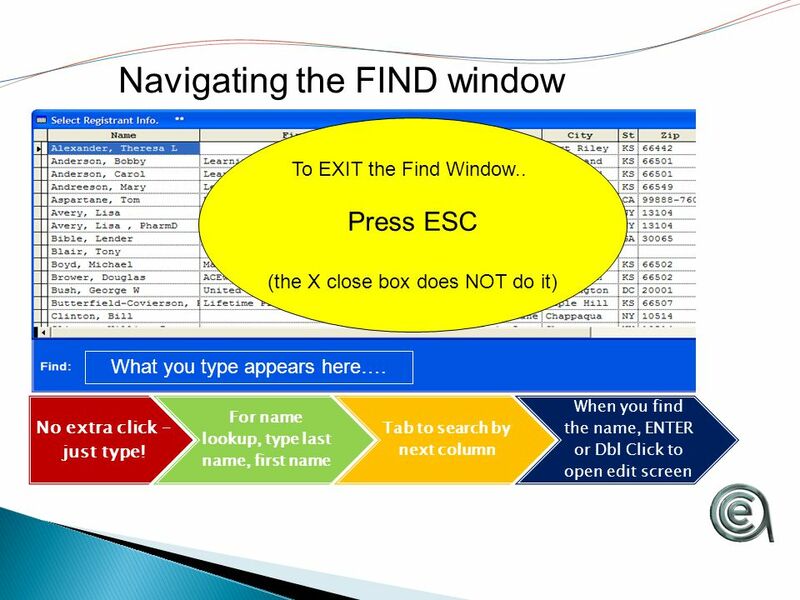 33 Navigating the FIND window No extra click – just type! 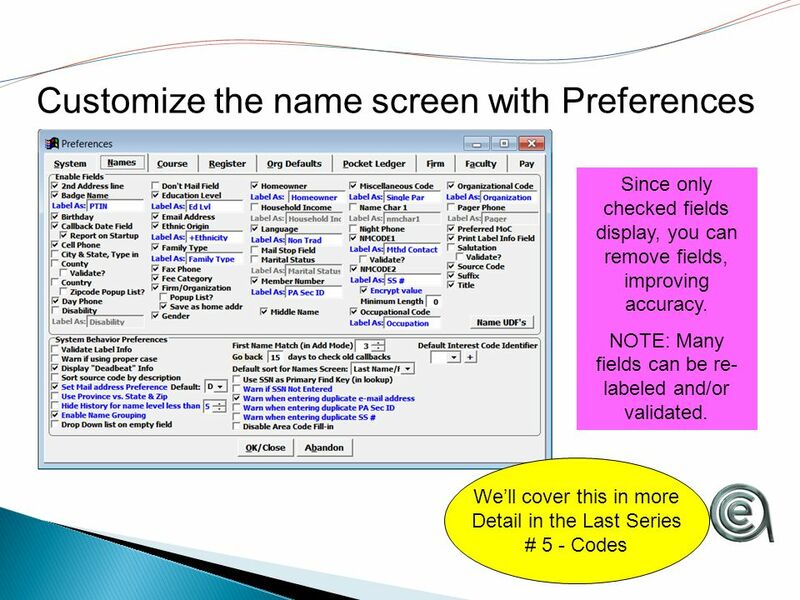 For name lookup, type last name, first name Tab to search by next column When you find the name, ENTER or Dbl Click to open edit screen To EXIT the Find Window.. Press ESC (the X close box does NOT do it) What you type appears here…. 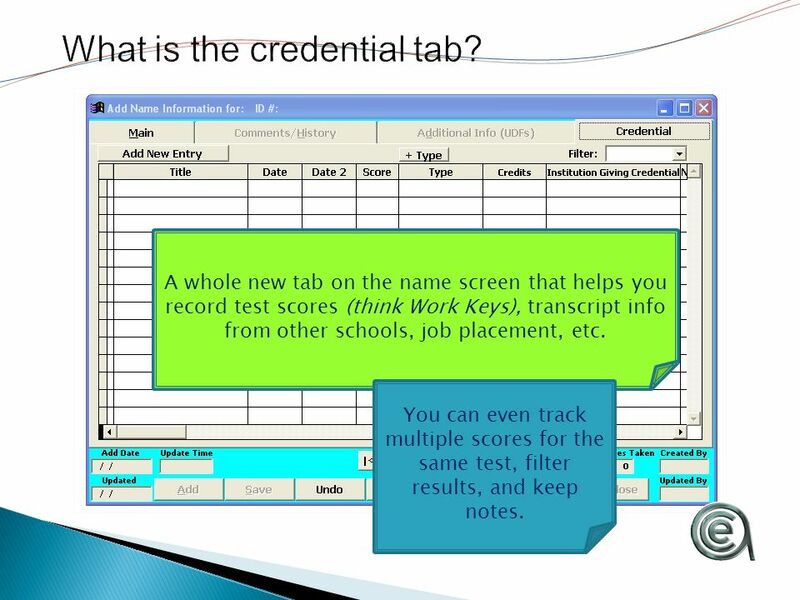 37 A whole new tab on the name screen that helps you record test scores (think Work Keys), transcript info from other schools, job placement, etc. 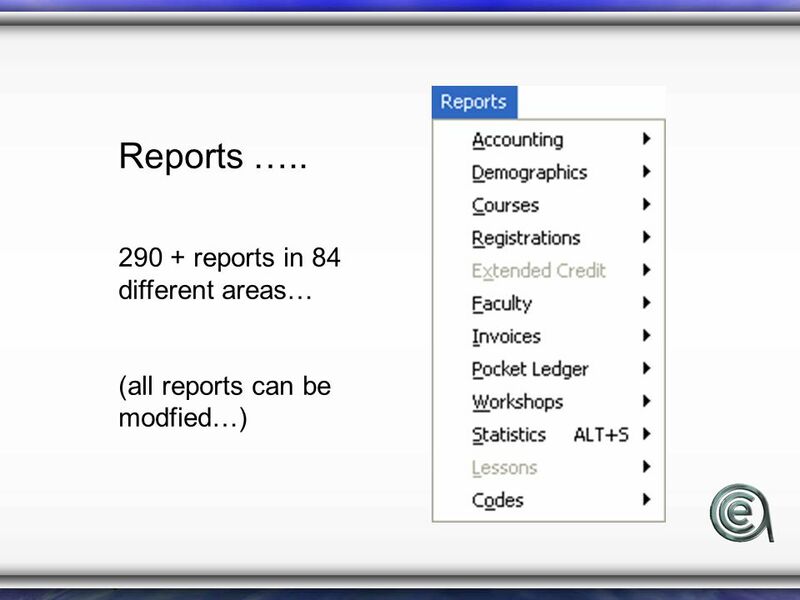 You can even track multiple scores for the same test, filter results, and keep notes. 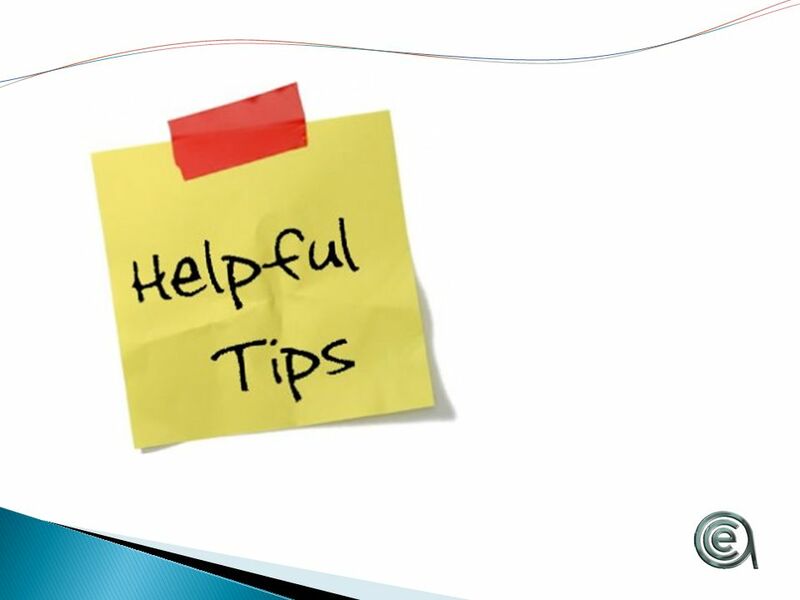 38 Here’s a few good tips! 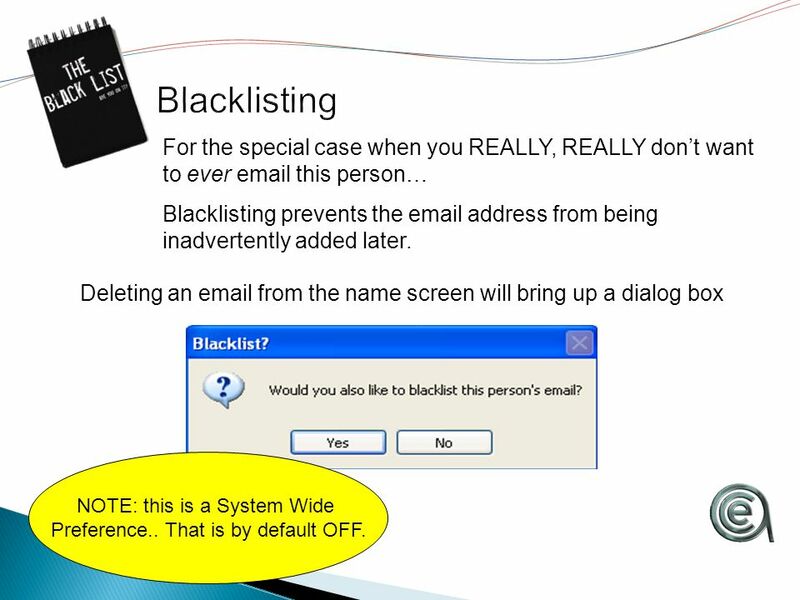 40 Deleting an email from the name screen will bring up a dialog box For the special case when you REALLY, REALLY don’t want to ever email this person… Blacklisting prevents the email address from being inadvertently added later. 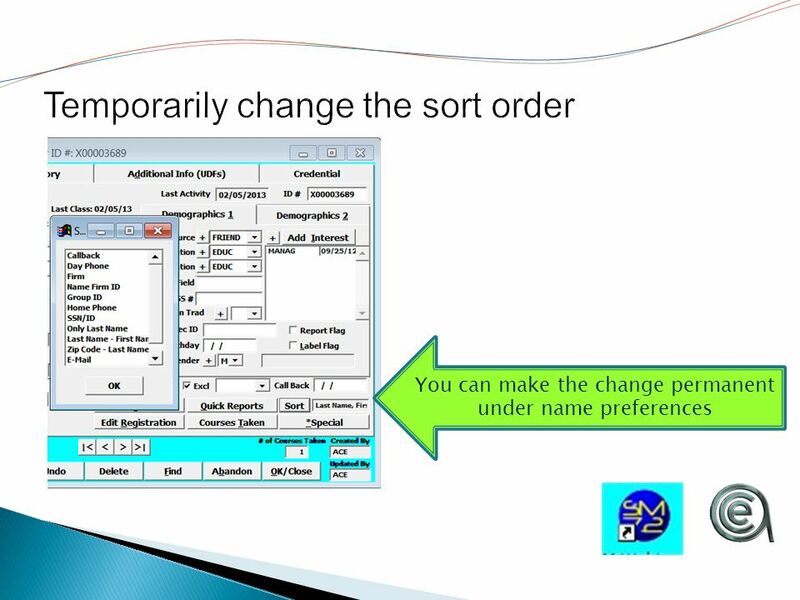 NOTE: this is a System Wide Preference.. That is by default OFF. 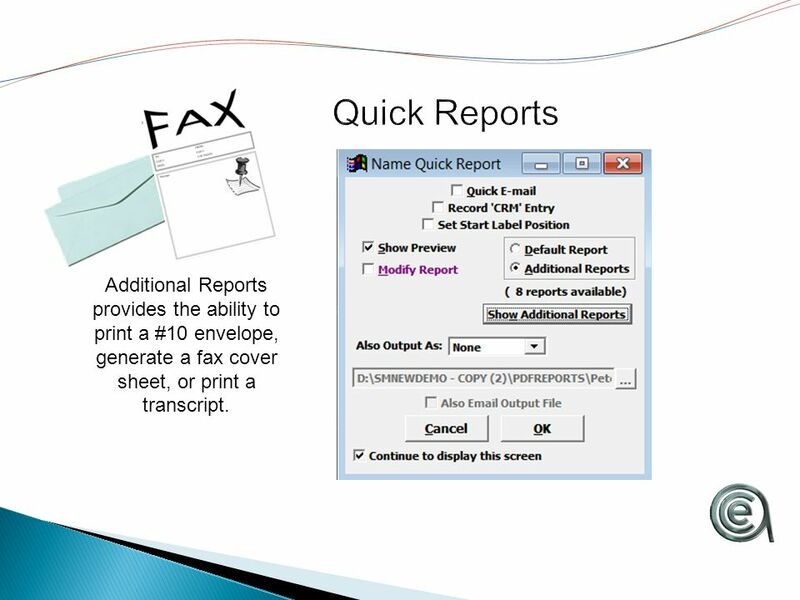 43 Additional Reports provides the ability to print a #10 envelope, generate a fax cover sheet, or print a transcript. 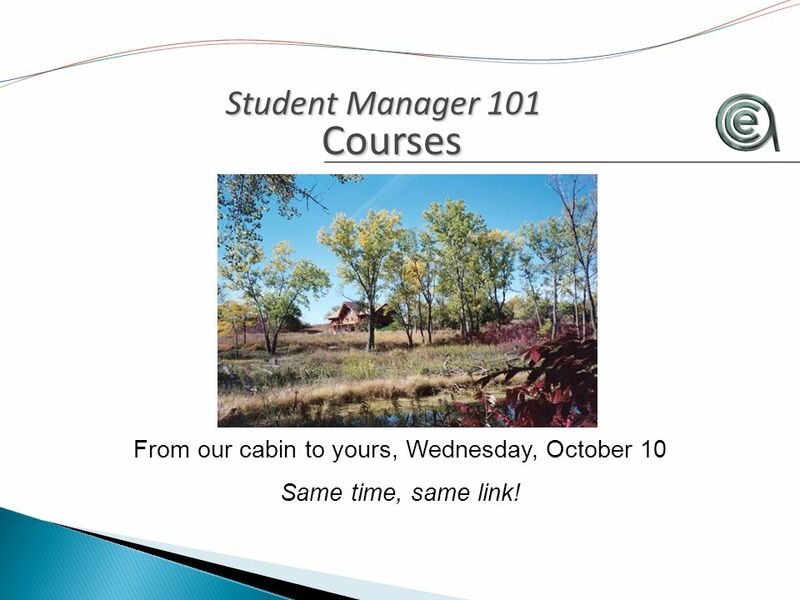 51 Student Manager 101 Courses Courses From our cabin to yours, Wednesday, October 10 Same time, same link! 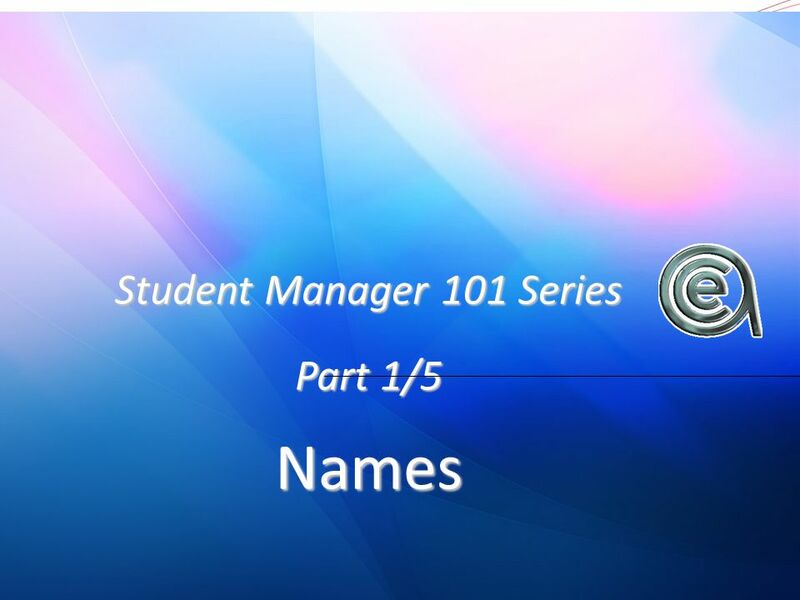 Download ppt "Student Manager 101 Series Part 1/5 Names. 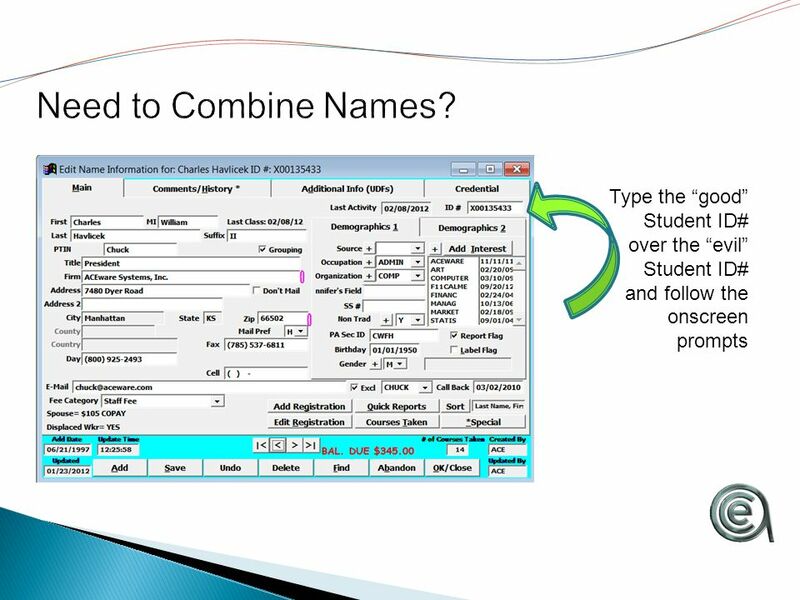 A general intro to Student Manager Inputting a name Editing names A few useful tips." 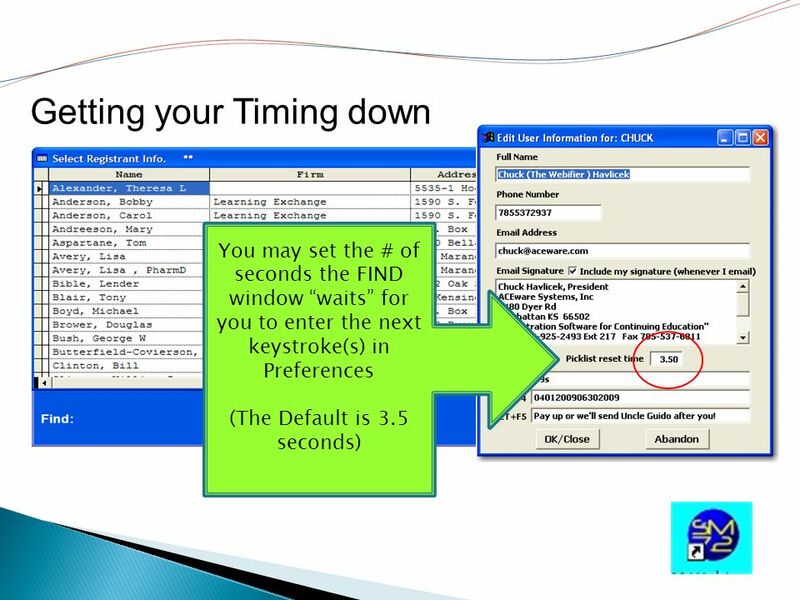 Codes & Coding An ACEware Presentation. 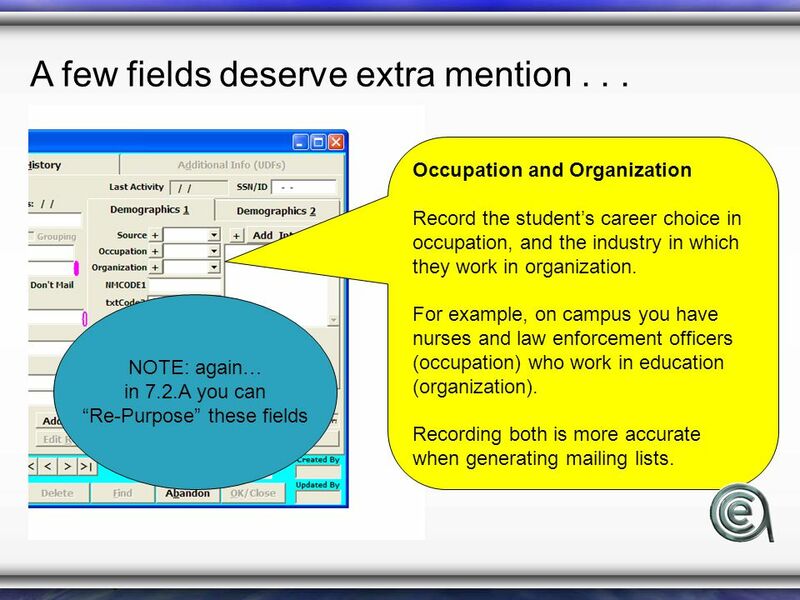 The Big Picture Coding Rules Adding Codes Preferences Interest vs Subject Codes Occupation vs Organization Source. 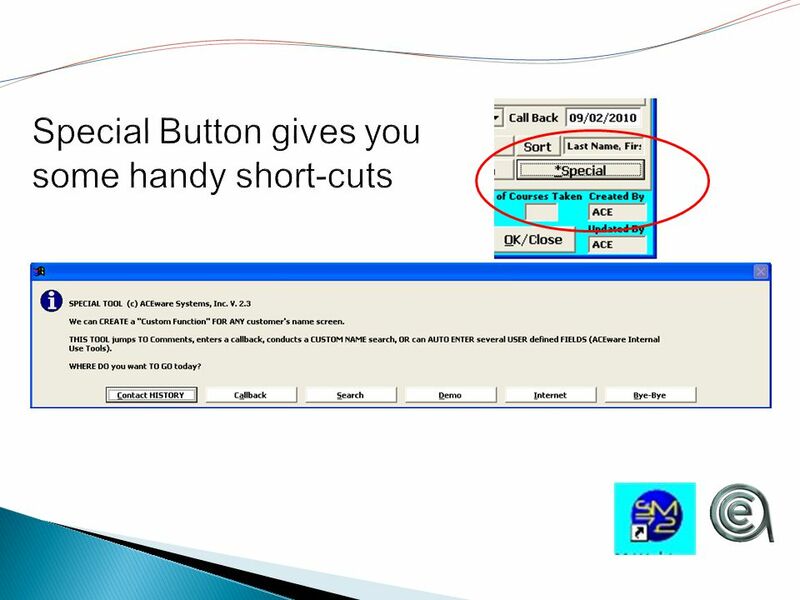 SM 101 Series Coding An ACEware Presentation. 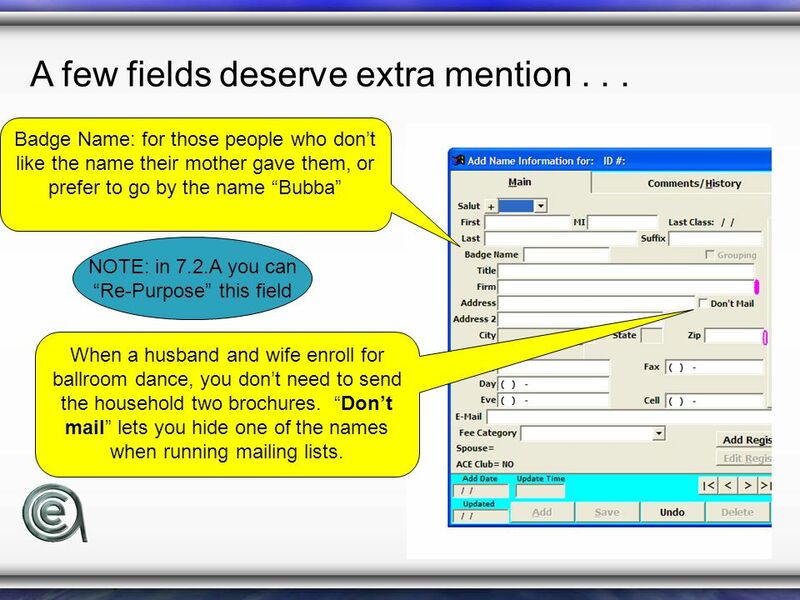 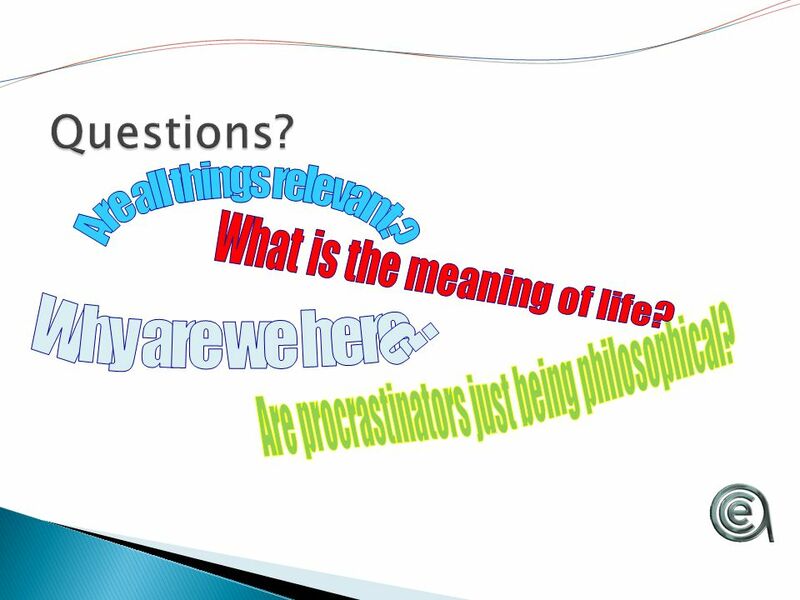 Today we will discuss The Big Picture Coding Rules Some Code Relationships –Subject  Interest Codes –Source. 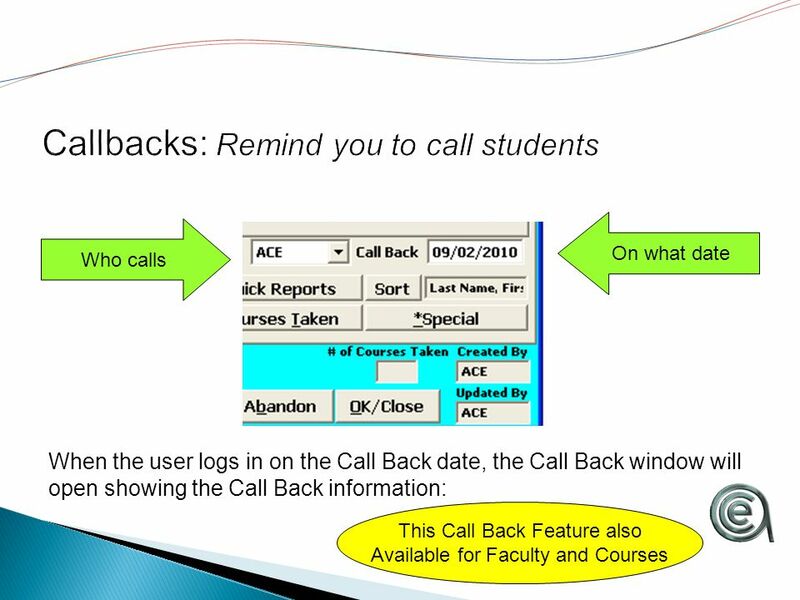 Attendance Module. 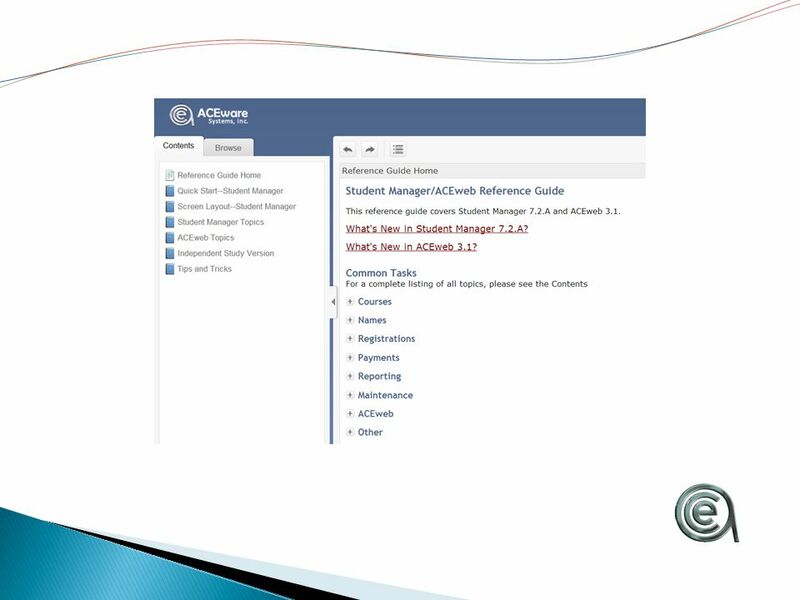 After we take attendance... What will the Attendance Module do for you? 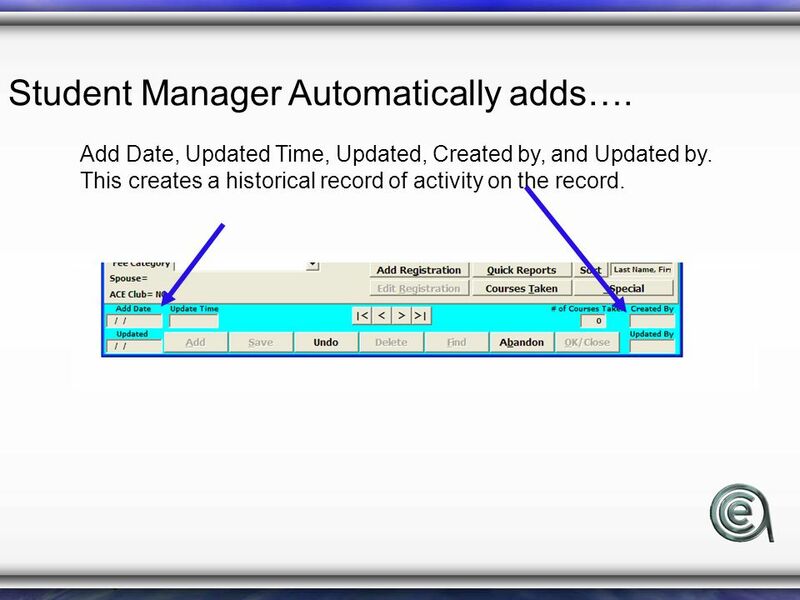 Getting things going (setup) Recording Attendance Custom Records. 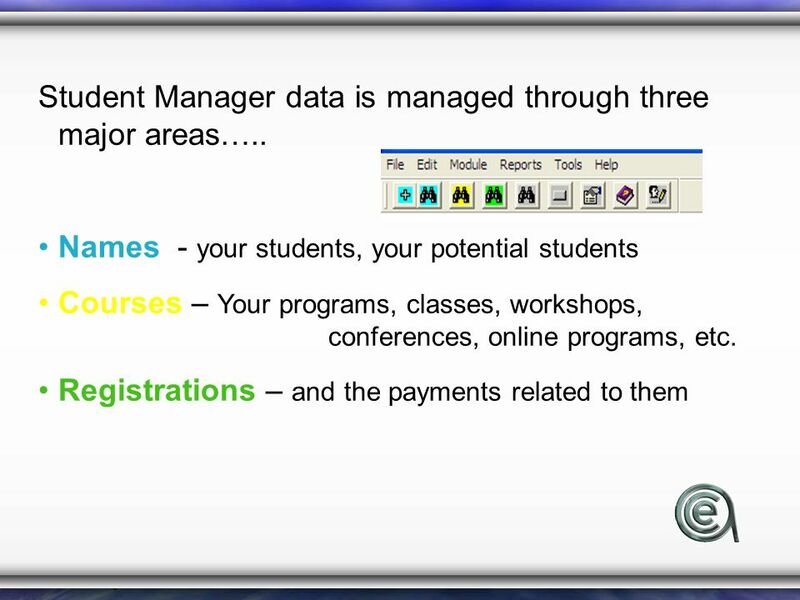 Student Manager 101 Courses An ACEware Presentation. 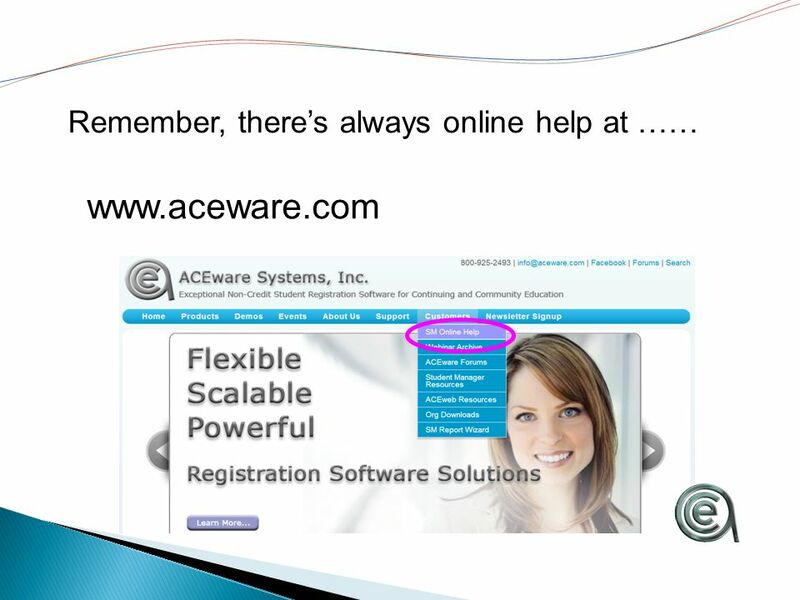 Mailing List Mania An ACEware Webinar April 3, pm. 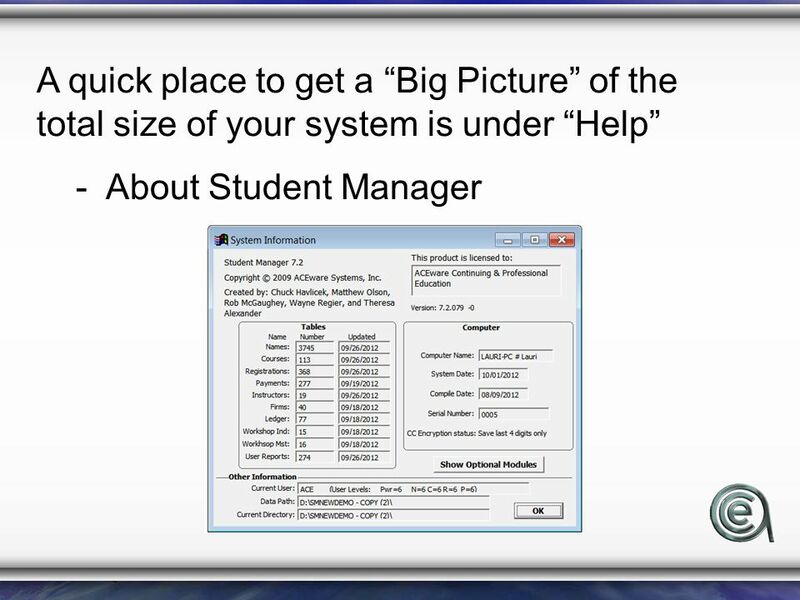 Student Manager 101 Registrations An ACEware Presentation. 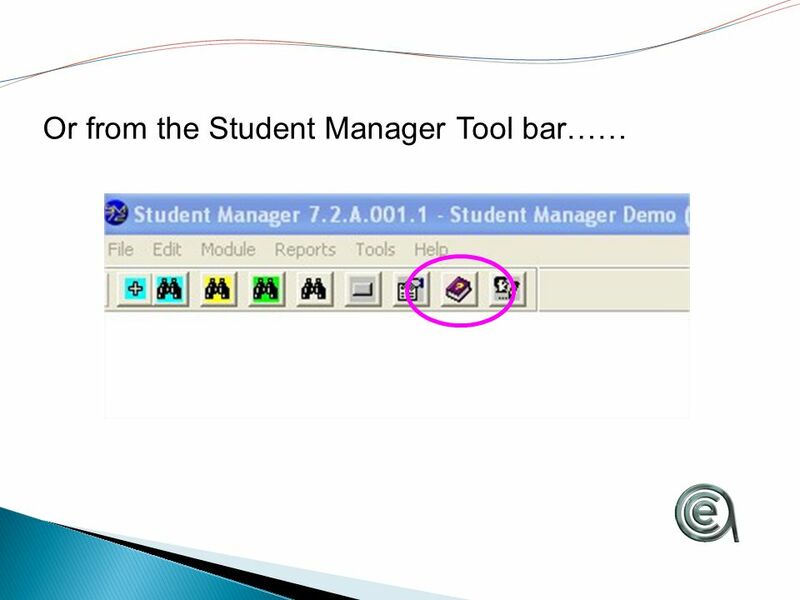 Student Manager 8 An ACEware Presentation. 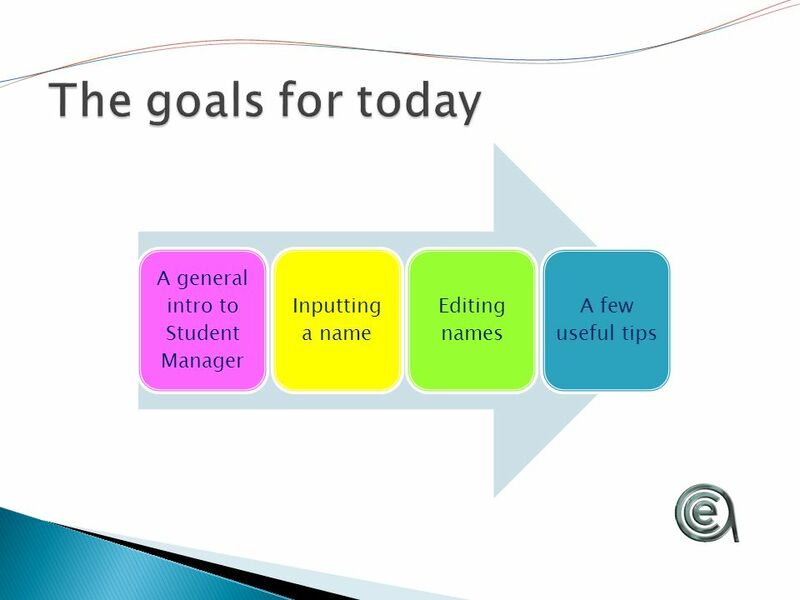 Agenda A general intro to Student Manager Inputting a name Editing names A few useful tips. 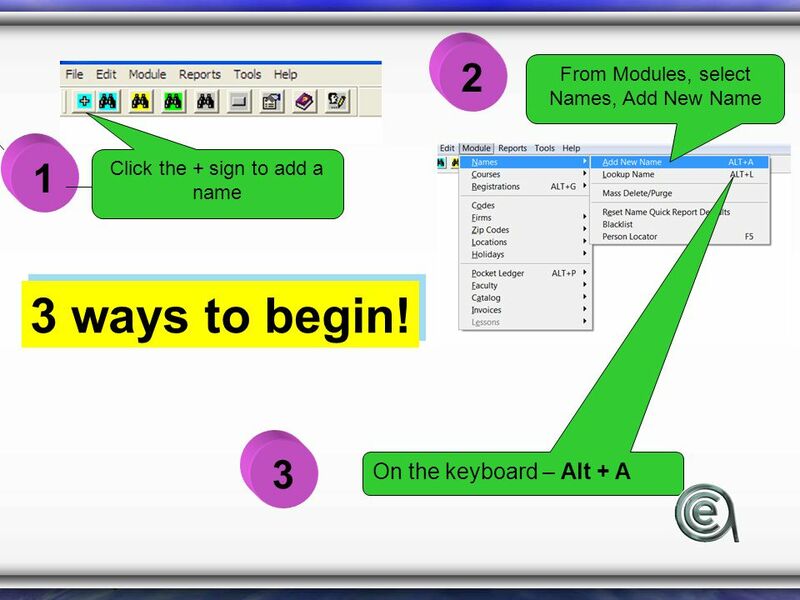 Microsoft Access Lesson 1 Lexington Technology Center February 11, 2003 Bob Herring On the Web at www.lexington1.net/AdultEd/computer/microsoft_access.htm.